At Maggiano’s Little Italy, our guests get more of everything. More laughs. More great food. Bigger stories. Better service. More fun. More energy. More enjoyment. Whether you’re looking for the right business lunch, a place for your holiday party or dream wedding, or a great evening out with family and friends, Maggiano’s has more of what you want. We at Brinker believe that "Serving the World a Great Taste of Life®" describes the soul of our company. It is what we stand for. With our 3-Choice gift card, anyone can experience our passion first hand. 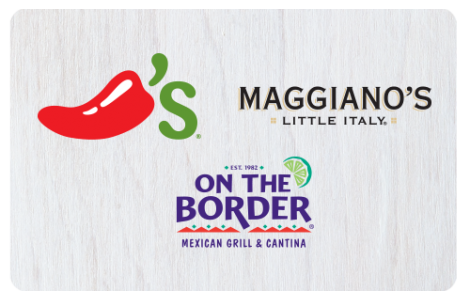 Honored at Chili’s Grill & Bar®, On The Border Mexican Grill & Cantina® and Maggiano’s Little Italy®, this one card is sure to satisfy any craving with a fabulous meal, prepared and served with true hospitality. Brinker 3-Choice gift cards are honored in all affiliated restaurants in the U.S., Puerto Rico, Guam and on U.S. Military Bases overseas. Our gift cards never expire or experience any service or dormancy fees. Looking for ways to use gift cards? Visit our Idea Center to learn some of the unlimited ways gift cards can be used!